So it took 35 years for Jeff Lynne to bring his Electric Light Orchestra back on the road. It was well-worth the wait. Lynne and this version of his ELO band – which did not include any other original members – delivered a dazzling 90-minute concert Wednesday night at Rosemont’s Allstate Arena. The place was packed, and rightfully so. The faithful were rewarded with an 18-song set, followed by one encore song, and enjoyed a night that, frankly, had no dull moments. Lynne, who is now 70, sounded and looked the same. He’s a man of few words. “Wow, it’s great to be back,” he said after the band’s second song of the night. Toss in several expressions of gratitude and a “Thank you, you’ve been fantastic. Wow,” near the end, and that was pretty much his chatter. That’s okay. We weren’t expecting the banter of a Bruce Springsteen or Paul McCartney. Lynne was content to focus on his music. He and his 12-person band provided lush sounds for a night filled with hit songs that had the crowd on its feet – save a few ballads – for the entire show. 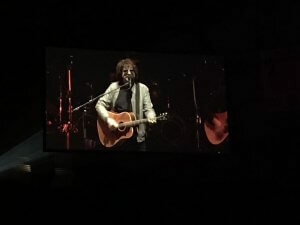 Jeff Lynne’s ELO plays “Evil Woman,” the second song of the concert. Photo by Steve Metsch. The band opened with “Standin’ in the Rain,” which gave it a chance to show off its musical chops. After that, it was hit after hit, many drawing loud “oohs” of recognition when the first chords were heard. Considering that most of the band’s hit songs were released between 1972 and 1986, it’s a testament to Lynne’s superior songwriting skills that they still sound fresh. “Evil Woman,” the night’s second song, had the crowd in the palm of Lynne’s hand, and it nestled there comfortably all night. The talented and versatile band did not disappoint, especially the three-woman string section – two on cellos, one on a violin. They added a depth to the music that synthesizers simply could not deliver. The night – despite the absence of “Strange Magic” – pretty much included all the big hits you may remember, songs like “All Over the World” and “Showdown,” which sounded sweet as ever, and “Do Ya” with blasts of bright lights accompanying each power chord, making for a one-two punch of pleasure. The light show, complete with dozens of lasers, added to the experience all night. Jeff Lynne, 70, looked and sounded like he has not aged a bit. Photo by Steve Metsch. Six songs in, Lynne cooled things off with the pretty ballad “When I Was a Boy,” which was “from the last album,” the 2015 release “Alone in the Universe.” You may ask why the band is called Jeff Lynne’s ELO. That because other members of the band have been touring as ELO or under a different name. A few years ago, I saw The Orchestra, composed of former ELO members, open for Deep Purple in Elgin. They were very good, but without Lynne, it’s kind of like the Rolling Stones minus Mick Jagger. It’s not that Lynne has been sitting around counting his money. He’s been extremely busy over the years, working on solo projects or producing other bands. Close with the late George Harrison, the former Beatle and Lynne put together the legendary supergroup, The Traveling Wilburys, which featured themselves with Bob Dylan, Tom Petty and Roy Orbison. Lynne paid tribute to that band by playing “Handle With Care.” Various band members picked up the vocals of Dylan, Petty, Harrison and Orbison. The song was received warmly and did sound great. Playing a video of the Wilburys was a very nice touch. Man, now that would have been an amazing tour. I really enjoyed “Livin’ Thing,” with the violinist at the front of the stage, flanking Lynne as he strummed his acoustic guitar. He was not shy about sharing the spotlight as each band member had their moments to shine. 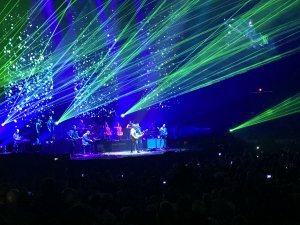 A stunning light show helped make Jeff Lynne’s ELO concert even more memorable. Photo by Steve Metsch. That was followed by an epic rendition of “Mr. Blue Sky,” perhaps the most Beatles-sounding song in the ELO catalogue from a guy who has such strong ties to the Fab Four. It’s funny how music acts as a time machine. I instantly recalled exactly where I was the first time I heard “Mr. Blue Sky.” It was on the kitchen radio in my childhood home. I was wowed by the song then and was again wowed last night, some 40 years later. The band returned for one encore song, and what an encore it was. They dusted off their cover of Chuck Berry’s “Roll Over Beethoven,” and turned it into a 10-minute jam session in which Lynne showed off his lead guitar skills. The guy can play. No doubt. Walking out of the arena, a friend and I heard many fans gushing about the show. I would have liked to hear another few songs. “Rock ‘N’ Roll is King” perhaps? Or “Last Train to London”? But I can’t recall seeing souvenir stands as packed. I took a pass on a $40 T-shirt or a $20 coffee mug, content to savor the memory of one fantastic night of music. It’s unfortunate that Lynne and ELO are not playing tonight at the Allstate Arena. I firmly believe they’d sell out the place again. But if you have the time and money, you can still catch this tour. 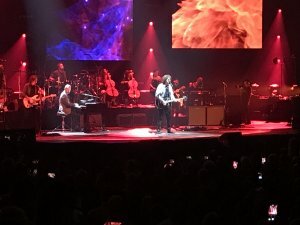 Jeff Lynne’s ELO plays in Detroit tonight, Toronto on Saturday night, and Madison Square Garden in New York City on Tuesday night. The tour closes Aug. 24 in Philadelphia. Perhaps it is time for a summer getaway? THIS POST HAS BEEN READ 16857 TIMES SO FAR. THANK YOU!